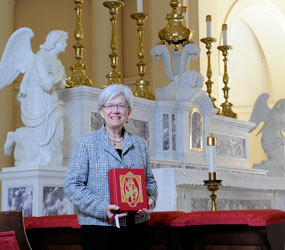 In the months leading up to the Nov. 27 implementation of the new English translation of the Roman Missal, Catherine Combier-Donovan has crisscrossed the Archdiocese of Baltimore on a mission of education. Raising awareness about the coming changes in the prayers Catholics will hear at Mass, the director of the archdiocesan Office of Worship has encouraged young and old alike to take time to “pray” the new texts. By reflecting on their meaning, she said, a renewal of the liturgical prayer life of the church may blossom. The original translation of the Roman Missal into English occurred when the Second Vatican Council called for use of the vernacular at Mass. It employed a principle called “dynamic equivalence.” Translators tried to get at the spirit and meaning of the text rather than a word-for-word translation. In the interest of simplicity, phrases were abridged and some prayers were reduced to short, declarative sentences. During the Jubilee Year in 2000, Blessed Pope John Paul II promulgated the third edition of the Roman Missal. It included prayers for the celebration of recently canonized saints, more prefaces for eucharistic prayers and other additions. The Latin text of the revision was finished in 2002 and translations have been ongoing since then with an eye toward a more literal rendering of the text – a “formal equivalence” that follows Latin syntax. The new translation is more in line with translations into other languages that adhere more closely to the original Latin. Additional changes will be noticed in the Gloria, Sanctus and other prayers. The translation also contains more biblical references and many more direct quotes from the writings of the saints. Combier-Donovan said it will be important to give people the chance to “grieve” the loss of the older translation, which is the only one many Catholics have ever known. Some parishes in the archdiocese will ceremonially say goodbye to the old translation by burying the Sacramentary on church grounds or a church cemetery, or respectfully burning the text. Others will save the book and use some of the prayers for gatherings outside Mass. To help Catholics follow the new translation, Catholic Review Media has produced pew cards in cooperation with the Office of Worship. More than 165 parishes, colleges, schools and chapels will be using the guide for congregational responses. More than 95,000 copies of the prayer aid have already been distributed. Visit catholicreview.org/newmissal for more information.